Metal injection molding (MIM) is an effective way to produce complex and precision-shaped parts from a variety of materials. This process produces parts for 50% less than the cost of CNC machining or casting. MIM is able to produce parts with complex shapes, superior strength, and excellent surface finish with high volume manufacturing. From design and tooling to production and quality engineering with in-depth technical and engineering expertise. Rockleigh Industries uses the latest wire EDM technology which is fully integrated with CAD/CAM. Using this technology, skills and experience we deliver a complete manufacturing solution for every project and application. Our services include prototyping, design, in-house tool production, wire EDM, specialist tool transfer service, high-quality manufacturing and logistics. We specialize in pressed metal parts with tolerances as low as one micron. Press from 5 tons to 160 tons. 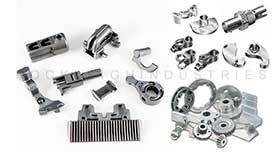 We do selective plating, metal finishing, de-burring, polishing, degreasing and heat treatment. Our in-house tooling facility manufacturing led frames and other metal components. Rockleigh Industries are specialists in complex materials and hard metals to manufacture stainless steel parts. Stainless steel stamping project. High-speed insertion or welding of precious metal contacts.